Difference between Gross NPA and Net NPA. Since the last two years if any issue is plaguing the entire banking sector that is the NPA (Non-performing Asset) issue. Almost all Indian banks whether PSU or private or NBFC’s have all been dealing with severe NPA levels. Now, let us understand what an NPA is. A bank’s business involves providing loans to the borrowers. The borrowers could be a company, individual or any organization. The loans that are issued by the banks are known as bank’s assets because the banks earn interest on the loans. But there is always a possibility that borrowers may default on the payment of interest as well as the principal amount. As per guidelines issued by the RBI, banks classify an account as NPA only if the interest due and charged on that account is not serviced fully within 90 days from the day it becomes payable. An asset becomes non-performing when it does not generate any income for the bank. Now, there can be scenarios where the borrower does not pay the loan amount even after the lapse of 90 days or more then these kinds then start coming under NPA’s. Suppose, a loan account of Rs. 1,00,000 @ 10% interest rate p.a. is due for payment on 30th September. If the payment is not made within 90 days starting 30th of September, the account will be classified as Non-performing Asset. Banks classify NPA’s into the following 3 categories based on how long they remain non-performing. The three categories are – 1. Substandard Assets, 2. Doubtful Assets and 3. Loss Assets. Standard Assets are those assets whose payment is received by due date. Gross NPA consists of Substandard Assets, Doubtful Assets and Loss Assets. Substandard Assets– If a loan account remains NPA for a period less than or equal to 12 months. Doubtful Assets– An asset is doubtful if it has remained in the sub-standard category for 12 months. Loss Asset– A loan account is declared as loss asset when the bank’s internal or external auditors declare it so or RBI inspection declares it as one. Gross NPA is the summation of all loan assets that are classified as NPA as per RBI guidelines. When the NPA occurs, it is not just an interest income loss to the bank, but a principal loss as well. That means, if a bank has lent Rs.100 Crores to a company with an outstanding loan amount of 80 Crores, then the bank would lose these 80 Crores along with the future interest payments as well when the company does not repay back. For precautions and to meet unforeseen losses, banks are required to make provisions as per RBI guidelines. RBI issues guidelines on Income Recognition, Asset Classification and Provisioning. Banks have to provide 25% provision for unsecured substandard assets. In case of doubtful assets (NPA for 1 year and more) 100% provision is to be made for the unsecured portion of doubtful assets and 25% for the secured portion. In case of doubtful assets of more than 1 year but upto 3 years,100% provision is to be made for the unsecured portion and 40% for the secured portion. If the asset is doubtful for more than 3 years, 100% provision is to be made for the entire asset. In case of Loss Assets, 100% provision is made. After detailed calculations for each and every account, banks arrive at Gross NPA. However, sometimes certain factors like ECGC coverage, insurance claims and various subsidy by govt in different loans are admissible. So, from the gross amount, these amounts and provisions provided are netted to arrive at Net NPA. It is the responsibility of the risk management and regulators to prevent the banks from taking excessive risks with respect to lending. There is always a possibility that banks would take extra risk in giving the loans, thus the regulators have defined provisioning regulations for bad assets. To elaborate, banks need to continuously assess their loans and set aside an amount aside, in the beginning itself, to accommodate for any losses. The key ratio in analyzing asset quality of the bank is between the total provision balances of the bank as on a particular date to gross NPAs. It is a measure that indicates the extent to which the bank has provided for the weaker part of its loan portfolio. A high ratio suggests that further provisions to be made by the bank in the coming years would be relatively low as the provision coverage is high(if gross non-performing assets do not rise at a faster rate). Net non-performing assets = Gross NPAs – Provisions. Gross NPA Ratio is the ratio of total gross NPA to total advances (loans) of the bank. Net NPA to Advances (loans) Ratio is the ratio of Net NPA to advances. It is used as a measure of the overall quality of the bank’s loan book. Provision Coverage Ratio = Total provisions / Gross NPAs. Banks with higher NPAs effectively have lesser funds to advance because of the higher provisioning that they have to provide i.e. lesser funds on which they can potentially earn interest income. Other negative impacts of high NPAs are that the higher NPAs will increase the amount of provisioning thereby impacting the profitability of the banks. Thus Banks will face difficulty maintaining capital adequacy ratio. There will be increased pressure on Net Interest Margin (NIM) and compulsiveness to reduce high NPA’s. Nowadays we don’t have to calculate NPA and ratios (%) on our own. StockEdge gives us the NPA and ratios of the last five years of any company listed in the stock exchange. 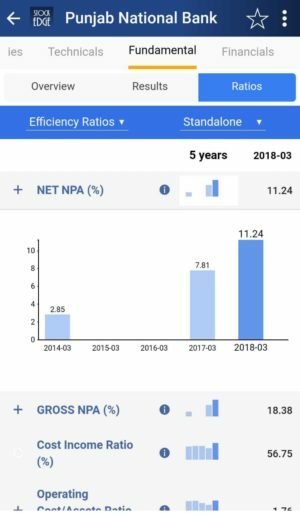 We can look and compare NPA ratio (%) of any bank and filter out stocks accordingly. Suppose we want to look at NPA and ratios of Punjab National Bank Ltd for last 5 years then click on the Fundamental tab of Punjab National Bank Ltd we will get Results tab. 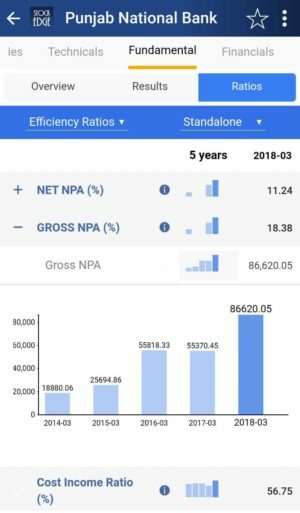 Then in the Results tab, choose Efficiency ratios, we will get NPA and GNPA ratios (%) of Punjab National Bank Ltd.
NPA of any bank is an important financial component to look at when analyzing a bank. It tells us about the asset quality of the banks. It can be compared on time basis and with other banks to understand the asset quality. With a click of a button, you can see bank’s NPA and NPA ratio (%) data of 5 years. Haven’t subscribed to stockedge yet? So, what are you waiting for, subscribe immediately to use this free feature. We also have paid featured scans based on Valuations, with the help of these ready-made scans you can with a click of a button filter out good companies. These scans are part of the premium offerings of the StockEdge app. Click here to know more https://www.stockedge.com/Plans/basicmembership.